We sat down with Emmett Miller of the guitar-happy band with the lovely name, on the occasion of their new EP, Aliens In The Outfield. and a bowl of curried corn chowder are brought out to me, Emmett Miller strolls in, bespectacled and dressed for the weather. 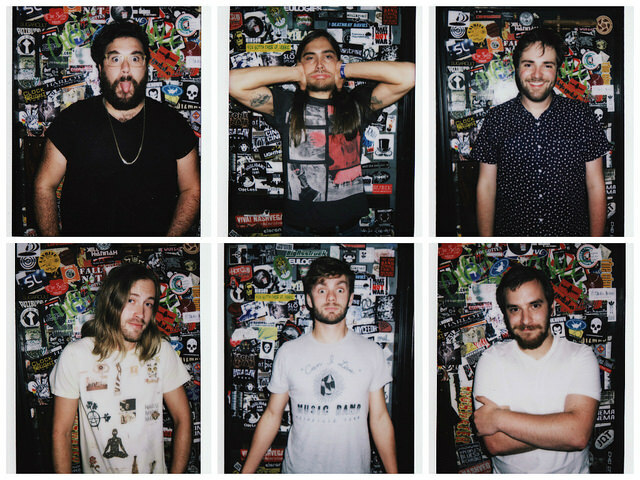 One-sixth of local rock heroes Diarrhea Planet, Miller is here to meet me to talk about the band’s latest release on the Nashville-based Infinity Cat Records, an EP titled Aliens In The Outfield. Though he sends his regards that the rest of the band wasn’t able to make it out, I’m slightly relieved, as this is my first interview assignment as a music journalist and (as is typical of a city where networking is inherently important) I had already been recently introduced to Emmett through a mutual friend. We catch up quickly, him politely asking what I’ve been up to since we last spoke and myself inquiring about the band’s most recent stint on the road. Once Emmett receives his Americano from our overwhelmingly courteous barista, we get down to brass tacks and begin a conversation about the band’s newest (and in my opinion, definitive) release. Aliens In The Outfield, much like a Diarrhea Planet gig, begins with contagious guitar riffs and emphatic vocals from bandleader Jordan Smith. “Heat Wave” is a propulsive pop punk assault that finds the group longing for one of its most influential supporters, Ben Todd, wishing that he was still “riding over bodies” with the rest of the gang. While the art seems to be lost in an age of Instagram captures and indifferent concertgoing, I’ll always remember seeing the constant mass of floating crowdsurfers when I saw the group play Exit/In (which Emmett enthusiastically confirmed as their home venue in Nashville) this past July, an impressive sight compared to seeing the group play for the first time to a comparatively sparse crowd in downtown Jacksonville last November. Anyone who’s seen a show knows that Diarrhea Planet always puts their best foot forward when given an opportunity, and the following song, “Platinum Girls”, takes that carefree energy and bottles it into a three-minute burst of goofy energy led by lead guitarist Brent Toler pining for an unnamed love interest. Emmett is glad to expand on the meaning of this one, drawing on much of the band’s history as Papa Johns employees with a massive crush on the “slightly classy” girl working at a nearby CVS. Brent takes his opportunity as lead vocalist here to write something of a torch song for the mystery subject, knowing that he’s a badass and that this girl should be his, as opposed to the lame Brentwood guys that were courting her at the time. It’s a great release of typical early 20s angst, and it’s one of my favorite songs by the band. The theme of longing carries to the next song, sung with vigor by drummer Casey Weissbuch. “Bamboo Curtain” is reminiscent of Weezer’s deified sophomore album Pinkerton, in both vocal and instrumental composition. I’ll leave the interpretations to our readers once they hear the record, but Emmett giddily refers to it as a song about “cherishing time to yourself.” The song is a quick burst, clocking in under two minutes, but I can imagine this one bringing the house down when the boys return to Exit/In for their now-traditional New Years Eve gig. The penultimate track, “Spooners”, is titled as such for a reason that Emmett can not expand on. The lyrics themselves are straightforward, as it would be hard to mistake a song about “getting fucked up when you can’t get your point across” as anything but a furthering of the struggle of being young in a world of old farts. I did manage to find out that it was written by Jordan in a Birmingham hotel while the group was stranded due to a faulty aquamarine Dodge tour van, purchased from a friend’s dad and on its last legs following two West Coast swings. If only every band that’s ever broken down on tour could write songs like this, we would be living in a much better world. It’s an incredibly complex sentiment from a band with a name like Diarrhea Planet, but the same can be said of the rest of the record. For six guys that have spent over 200 nights on the road in the past year, Aliens In The Outfield is an incredible effort and we should all be so lucky to consider them a Nashville act. In a city dominated by starry-eyed country acts on Broadway and aspiring transplants migrating to town, it’s only fitting that its most promising act has been quietly lighting up the country one venue at a time, representing their roots the entire time. Head to The End later tonight to catch two of their side projects: Spanish Candles and Duck.